Chamrousse, the first resort in Isère to get Flocon Vert label! Flocon Vert, is a labelthat guarantees the sustainable commitment of mountain resorts. This label is developed by the association Mountain Riders to give mountain lovers a clear vision of model tourist sites. 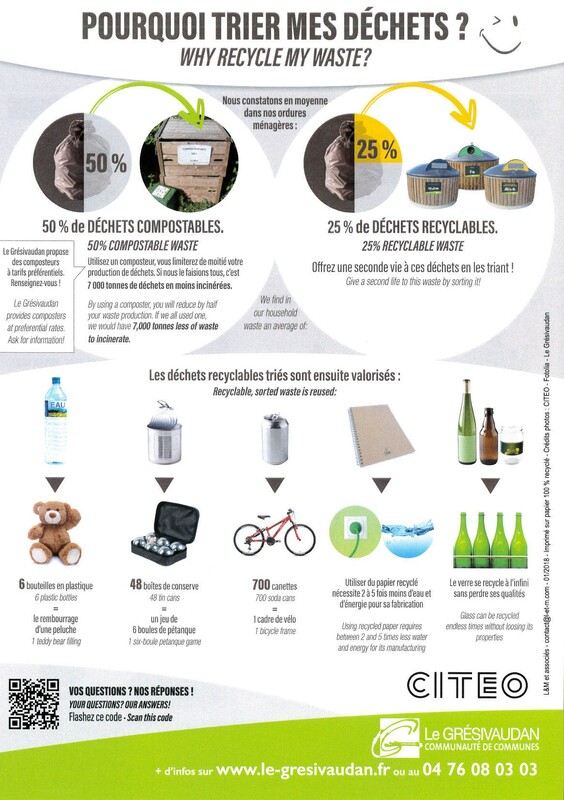 Choosing a Flocon vert destination for our holidays is supporting a responsible tourism! Chamrousse resort has applied to Flocon Vert label in 2016. It was assessed in December 2016 and the labelling board granted Chamrousse the label in January 2017. For a year, the tourism, the resort players have worked to comply with Flocon vert specification and its 31 compulsory requirements (currently only 21 requirements), together with Mountain Riders, bearing the label. This work has been carried out in cooperation with the different players of the resort, but also the inhabitants, employees via a participating process with a Sustainable Development group gathering regularly, open to all of those who want to move forward. If Chamrousse complies with the compulsory requirements, the resort is aware that the process implies a follow-up and was able to identify the axes of progress. However, this label rewards the efforts made and shared with all people working for a more sustainable world. All information on Flocon Vert website (in French). Download the file presenting the Flocon Vert commitments (in French) "Présentation des engagements Flocon Vert à Chamrousse". More information about environment at Chamrousse town hall website Chamrousse. Ambitious project to rehabilitate the old building with the 2030 Chamrousse project. Discover the 2030 Chamrousse project presentation. Commitment to the implementation of a tourist accomodation quality plan consisting in having classified all the properties in rental by the Tourist Office Booking Centre through the Clévacances system. Private renovation by raising the awareness of property owners to renovate via the Affiniski device. For more information, please contact Chamrousse Booking Centre. The municipality has benefited from a council in shared economy within the framework of the Territory Energy Air Climat Plan set up by the Grésivaudan municipalities community and from a financing of the Isère department union of energy sources. Diagnostic season after the season to improve the consumption of the most energy-intensive buildings such as the distance control of the Croix de Chamrousse restaurant, the control of the heating in the ski patrolmen’s cabins and the double flow ventilation in the offices of the ski lifts admistration. Sensitive Natural Area: the Arselle Plateau and the Achard lake are classified in a Natura 2000 site. For their protection, markings and information signs have been set up to encourage respect for paths, flora and fauna, in particular cembro pines undergoing mutilations (cutting of branches, engraving in bark...). Important budgets devoted to the protection of natural spaces, in particular on the environment reopening works that allow the maintenance and the development of protected species such as the black grouse. Discover the presentation of the natural areas of Chamrousse (only in French). Agricultural areas: the traditional pastoral activity is actively preserved in collaboration with the Alpine Pasture Federation. It has a grazing plan that allows the shepherd to optimize grazing areas and respect the available grassland resource and the preservation of avifauna. The shepherd is present in Chamrousse from mid-June to the end of September with its 1600 sheeps and 35 goats. Green electric energy supply: the resort has renewed its contracts with a supplier guaranteeing a supply of green electric energy and some solar panels display the generated and consumed electricity on GTR Mountain buildings. « Wattaubalcon » operation: the Municipality and the ski lifts Administration have leased 2 roofs meeting the criteria of solar electricity production to the Wattaubalcon association. The installation has been done in 2018 on the roof of the salinière restaurant at the Arselle plateau. Renewal of water pipes: there is a quality water in Chamrousse. It is captured in the sources of the territory and then processed. The tourist traffic at the resort requires significant equipment and explains why despite the abundance of springs, water is expensive. Think of the eco-gestures. Selective sorting: the municipality, its inhabitants and the employees practice the selective sorting with a large number of semi-buried containers. It relays a new sorting policy aimed at the best waste recycling (waste may be a resource when it is properly sorted and valued). Help us to reach these goals! 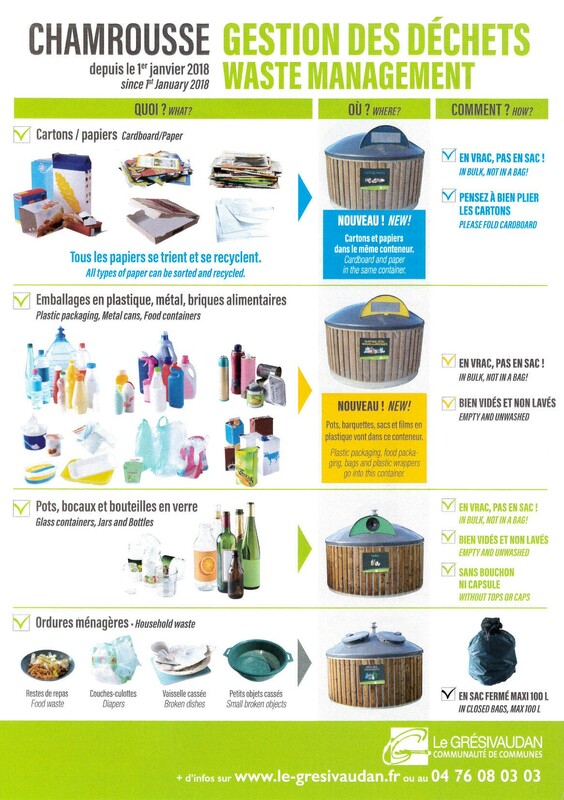 All packaging is recycled in yellow garbage and yellow containers. Download the sorting guide. Snow culture: thanks to it we offer you a quality snow. To make it, we need water and we are committed to optimize this precious commodity. The water used is provided by hill reservoirs, one of which is fed by rainwater and melting snow, and a second by small streams. All waters return to the same watershed. The slopes department aware of the challenges of this precious resource has set up a water management plan that optimizes the necessary consumption. Damage plan: training our drivers in eco-driving with a GPS control as well as the acquisition of a geo-tracking software allowing the optimization of the damage plans and a reduction of the number of groomers. Lighting: high-performance power tracking system that has saved 570,000 KWH, including with the abnormal electrical detection at night and the replacement of the projectors used for night skiing with nearly 50 percent of energy saved. Waste sortation awareness day: a collection of wastes open to all is organized by the resort every June. It is the opportunity to exchange and share through awareness workshops. A compost workshop is organized for residents in August 2016. 1st compost bin offered, the following are delivered to the inhabitants and residents free of charge by the technical services of the town hall. A sorting awareness workshop is organized for the merchants and the building caretakers in December 2016. No more cigarette butts on the ground: you can find washable pocket ashtrays, reusable and recyclable made available with the free participation of smokers at the Tourist Office so that butts and other small wastes are no longer scattered over our natural spaces. These ashtrays are produced locally in order to enhance the local economy by the manufacturing and assembly workshops of the company Naturen, based in Meylan. Operation of skis recycling: developed with the resort’s sports shops in partnership with the 7 Laux resort to share the transport costs and the reprocessing of used skis in partnership with Trivallée. Find the merchants who have participated thanks to the logo on their front. In 2018, Chamrousse was awarded with the « Trophée des cimes » for its skis recycling operation. The files were examined by a jury of independent experts concerned with the sustainable development in mountain areas. Educational school trips: the quality of Chamrousse environment allows it to host many educational school trips with mainly students from primary classes, but it also receives the visit of high school students in technology section oriented towards the sustainable development. Each year, the Tourist Office introduces the welcome desk jobs to students with academic problems, with a focus on the soft skills rather than academic skills. Conservation of the school and school canteen: conservation of a classroom for the children of chamrousse and the canteen that welcomes the school’s pupils and the nursery’s children, offers meals cooked on site by a real chef using local and organic products. The children of the school benefited from an eco-gestures awareness workshop led by the AGEDEN. Thus, the children attending school in Chamrousse have made a personal commitment to reduce their consumption. The school compost started in June 2017. Charging terminal for an electrical vehicle: two terminals on the resort, a SEDI terminal in Chamrousse 1750 which operates either with a SEDI card, Kiwhi or a credit card and a Schneider terminal located next to the gas station in Chamrousse 1650, which works with an RFID card (ski pass for example). Encourage the soft mobility: 1 day of electric assistance cycling for the resort’s employees in partnership with Sport 2000 and summer entertainment in partnership with Isère Tourisme for customers. More information on Chamrousse Town Hall website (only in French).